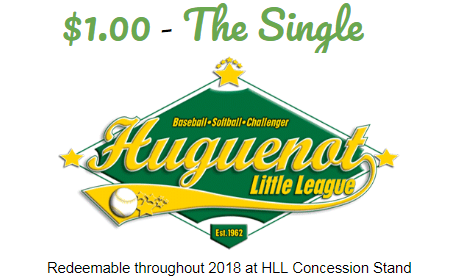 This year HLL Concession Stand is happy to offer Coaches and Families alike, Magic Money! Magic Money can be purchased in bulk pre-season and used throughout the 2018 season for concession stand purchases. Sold in 1 dollar increments this magic money is a great way for coaches, parents, or grandparents to celebrate an amazing game or simply “cool off” with a snow cone, or snack of their choice. Parents, want to reward and recognize chores, homework or good deeds? Purchase your Magic Money today and have your child “earn” their trips to the concession stand. Simply redeem the Magik Money as if it were cash. No need to accompany them to the stand with your credit card, and no need for them to worry about carrying change. A win:win situation! Minimum purchase $20.00. Magic Money will be sold at this years softball and baseball assessments, get yours today.